President Larry Roberts called the meeting to order at 6:39 p.m. Directors present for the meeting were Doug Alred, Bonnie Brooks, Errol Daniels, Susan Haag, Angela Harris, Franz Lerch, Todd O’Donnell, Ty Payne, Larry Roberts, Paul Smith, Lamar Strother, Douglas Tillett, Stuart Toomey, and Jim Van Cleave. Directors Jane Alred, Stan Lambert, Larry Sassa, and Connie Smith were absent. Guests in attendance were Richard Fannin, Dennis Harrison, and Jeff Wight. Approval of 1/2/18 (January meeting) minutes: On a motion by Lamar Strother and seconded by Stuart Toomey, the January board meeting minutes were approved as submitted. Treasurer’s Report: Treasurer Bonnie Brooks distributed copies of the Balance Sheet and the Profit and Loss Detail Statement through January of 2018 and then thoroughly explained all the line items. As she went through the line items, she mentioned that 1099 had been mailed out to all those who were to receive them from the club. Jacksonville Trails Master Plan – Larry Roberts gave an update regarding the progress Groundwork Jacksonville has made since our last meeting. They are still in the process of meeting with potential funders. They have several meetings lined up with the City of Jacksonville the week of February 12th. Also, they anticipate writing a check within the next 2 weeks. Run, Jump, Throw 2018 – Angela Harris reported that she is currently looking for the club to host the events this year on a Saturday, which would allow us to reach a wider audience of kids. Currently the proposed date is April 14th, with the hopes of hosting the event either at Jacksonville University or the University of North Florida. An addition to this year’s activities would be the introduction of the javelin, which is now an event that is offered in the school track meets. 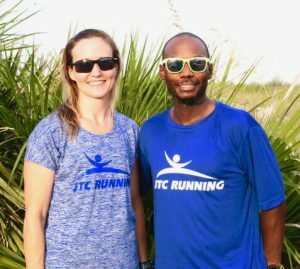 JU Running Lab – Jeff Wight reported that the running lab has 10 appointments signed up through January, which 8 were in a 2-day period. Jeff gave an overview of the progress the staff had made since opening the lab. Last September the staff went through training, in October the website was launched, and had 10 immediate signups. In December emails went out regarding the lab opening. The lab has had some success with their low cost-high impact advertising. The focus of the lab is research, which they have been able to perform analysis on 10 runners a week. The lab will be on display at the Donna Marathon expo so that runners can get a more in-depth look at the process. Dennis Harrison detailed his recent visit to the running lab where he and his son received their biomechanical analysis. He spoke of the usefulness of the data contained in the reports, the helpfulness and friendliness of the staff, and the process to confirm JTC membership. Larry requested a list of JTC members that have signed up for the analysis and a list of new members that have joined JTC from getting an analysis done. Proposed Board Member: Dennis Harrison – Larry Roberts mentioned that he was recently contacted by a current member who wanted to get more involved. The member, Dennis Harrison, meet with Douglas Tillett and Larry Roberts in addition to assisting at the Creekside track meet. Each member in attendance introduced themselves. Dennis gave a brief introduction of himself and a synopsis of the work he has done in the past with various running organizations. Based on the recommendation of the executive committee, Larry proposed to elect Dennis Harrison to the board. Based on a show of hands, the motion was passed. Possible New Events at Cecil Commerce Park – Guest speaker Richard Fannin gave a presentation on the Cecil Commerce Park. He has been using the park for the past year for his high school cross country team, as well as hosted a cross country event last August. Richard presented the idea of using the facilities for more events in the near future. The current owners are willing to allow use of the park for cross country events. The owners have a 4-year lease. Currently Richard has courses mapped out on the golf grounds of the park which entail a 10-mile route as well as a 5K cross country course. No exact dollar amount was determined, but an estimation of $2,000 for various signs and course markings would be needed to start. It was determined that the next step would be for Richard to meet with the Race committee after Gate River Run to further develop a plan. Summer Running Camp Scholarships – Doug Alred stated that this is usually the timeframe we begin accepting applications for our summer camp scholarship program. We will set up a link on our website for details of the program and how to apply. Once the application process begins we expect to have all applications submitted by the end of May. Winter Beach Run (Sun 1/21/18) – Doug Alred reported that the race was held on a beautiful day. He passed out the financial sheet from We had over 310 marathon high runners, which caused for another great race and turnout especially considering the Jaguars AFC playoff game going on at the same time. The new finish line area located up on the pavilion area was a success. Gate River Run (Sat 3/10/18) – Doug Alred reported that this would-be a down year in terms of sponsors and sponsorship, however sponsorship numbers are still good. We lost a few smaller one-time sponsors and a large sponsor in Skechers Performance, but we are still on track. We have also been able to save roughly $20,000 with several cutbacks this year, one noticeable cutback includes the use of only one jumbotron at the finish line this year. We currently have over 10,000 race entries, which is about standard for this time of year. With a little over a month to go everything is looking good. Gate River Run Elites – Jim Van Cleave reported on the status of this year’s elite field as of early February. It was also stated that interest usually spikes after big races and we should benefit from the Cross-Country Championship that was held last weekend in Tallahassee. He discussed the overall budget for the field and the criteria that must be met to receive compensation for expenses. He detailed several runners, as well as teams, that would be attending and mentioned others that are currently prospects. At this point we have 68 elite level runners scheduled. Gate River Run Runners Expo – We are currently in the process of staffing our both for the Gate River Run. The shifts are listed on the website under the events page. COMMUNITY & PUBLIC RELATIONS – No Report. FINANCE – Bonnie Brooks reported that the Finance Committee had received several monetary requests since our last meeting. She detailed the request submitted by Nathan Stanley of Bishop Synder for $500 for their upcoming Danny Brown Invitational which is scheduled for 2/23/18. Douglas Tillett made a motion, seconded by Stuart Toomey, that we give $500 to Bishop Synder was passed. Bonnie next discussed the request submitted by David Frank of Bartram Trail for $500 for their Bear Classic meet in February and $500 for their Friday Night Spikes meet in April. A motion was made by Todd and seconded by Stuart to approve the request of $500 for each event was passed by the board. It was determined that another Finance Committee was not needed prior to our next board meeting. MEMBERSHIP – Stuart Toomey reported membership is currently at 1,165 active members. MERCHANDISE – We will have merchandise for sale at the Donna expo. We are still in need of volunteers at the expo so we can sale merchandise as well as get new members. Todd and Susan offered to assist if needed with loading and unloading merchandise. Larry stated that our website provider Wild Apricot has started offering services for an app and an online store. Currently the app is only available on Apple devices. Larry stated that this is something we need to consider because we want to be able to provide online orders for merchandise like other running clubs and also make our website mobile friendly. COMMUNICATIONS: Newsletter, Social Media – The current issue has been printed and is currently in the mail. The newsletter is accessible via the email blast that has been sent out. Larry discussed how the new email version of the newsletter now includes images with color and active hyperlinks. There was a brief discussion about how individuals viewed their newsletters, rather online via a mobile device or their printed copy. Deadline to make the next issue is February 10th, however arrangements can be made to extend the deadline until the 15th if someone needed additional time to submit a story. VISION & PLANNING: Tomahawk Park repairs/cleanup/plaque – Doug Alred reported that Tomahawk Park cleanup has been completed. A motion was presented by Larry and seconded by Stuart that we spend up to $500 for a plaque in recognition of Tomahawk Park. The motion passed. NEXT MEETING – The next board meeting will be Tuesday, March 6, at 6:30 pm in the Mediterrania Restaurant. The January meeting was adjourned at 8:03 pm.